Mother’s Day is a holiday I truly look forward to every year. I know some may say that it’s just a “greeting card holiday,” but as a mother (and a daughter), I say thank you to those greeting card companies. Being a mom is often a thankless job, so bravo to whoever it was that saw fit to create a holiday to honor those women who work so hard and do so much. Of course we should take pause and celebrate the women in our lives who helped us become who we are. As the only female in a house full of boys, it’s nice to have a day set aside, devoted to all things feminine. On Mother’s Day, I enjoy flowers, brunch and a little relaxation. There’s often champagne involved, and pretty little baubles and treats. I think there’s no more perfect time to take a little extra care in creating a special sweet treat than Mother’s Day. Macarons make such a lovely handmade gift. They are delicate as a flower, and the colors make such a beautiful presentation. You may have heard that macarons can be a little tricky to make, but I’m here to tell you that with proper technique, and the right equipment, they’re a breeze. I like to measure out everything the night before. Leaving the egg whites out overnight, at room temperature, results in a fluffier and more stable meringue. I place the egg whites, covered, directly in the larger bowl of my KitchenAid® Stand Mixer. I recommend weighing out the sugars and almond meal with a kitchen scale for more accuracy and precision. 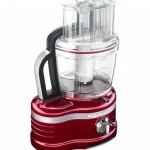 I weigh my powdered sugar and almonds right in the prep bowl of my KitchenAid® Pro Line® Series 16-Cup Food Processor. Then I can just pop it in place and give it a whirl. It breaks up any larger pieces of almond and pulverizes everything into a fine powder. Give it a sift, just to make sure everything is aerated and well combined. Whisk the room temperature egg whites until they get foamy, then sweeten with granulated sugar, and whip into a stiff and glossy meringue. Fold in the almond mixture. You’ll know the batter is ready to be piped when it falls from your spatula in one long, continuous ribbon. Pipe the macaron shells a little smaller than you want your finished product to be. They tend to spread a bit as they sit! Two KitchenAid® Nonstick Sheet Pans are just the right size for a full batch of Strawberry Rose Macarons. They are so sturdy and durable, I never worry about them buckling under high oven temperatures, and they provide such an even bake. No hot spots on these pans! It can take anywhere from 20-30 minutes for a thin, dry membrane to form. At this point, they can go into the oven. 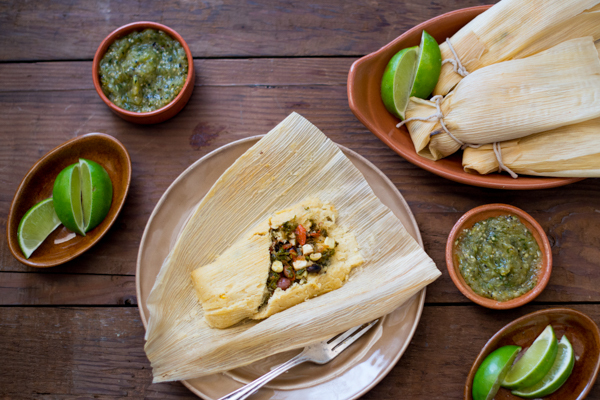 While the shells bake and cool, you can whip up the filling. The smaller bowl of the KitchenAid® Stand Mixer is just the right size, and it nestles perfectly into a saucepan filled with simmering water. Cook the egg whites and sugar until the sugar dissolves, then pop the bowl back onto the KitchenAid® Stand Mixer and whip up the fluffy buttercream. A few drops of rosewater add a delicate fragrance and a flavor that complements the tart, seasonal strawberries so nicely. I love to pipe the strawberry rose buttercream in a ring around the outside edge of the macaron shell. This creates a little nest that can hold a juicy drop of strawberry preserves. It’s such a delicious surprise when you bite into the marshmallow-y macaron to find that luscious fruit! 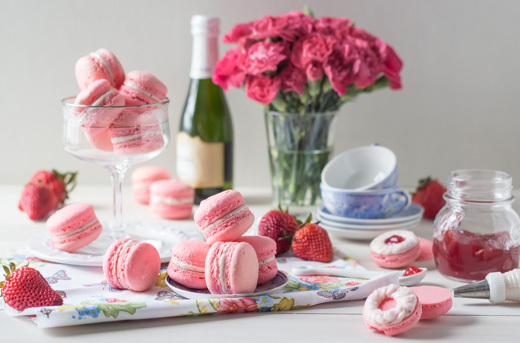 Show your mom how special she is by whipping up a batch of these beautiful macarons for her this Mother’s Day! 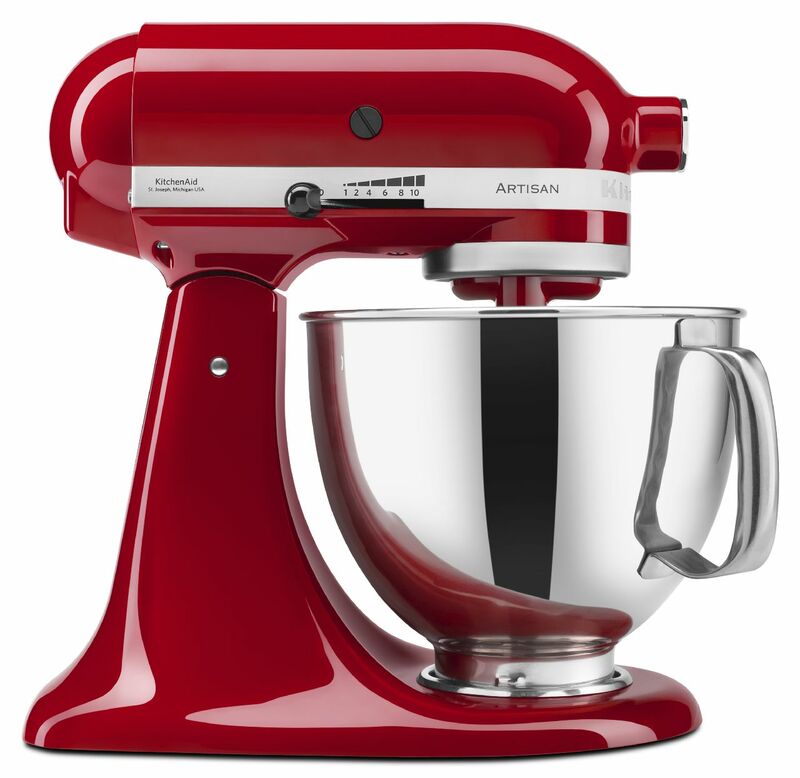 Place the egg whites in the larger bowl of the KitchenAid® Stand Mixer, covered, and allow to come to room temperature. Place the powdered sugar and almond meal into the prep bowl of the KitchenAid® Pro Line® Series 16-Cup Food Processor. Process to a fine powder, and sift to remove any larger pieces that may remain. Whip the egg whites on medium high speed until foamy. Slowly and gradually add the granulated sugar, while whipping. Tint with a few drops of gel paste food coloring, and continue to whip until the meringue holds stiff peaks. Remove the bowl from the KitchenAid® Stand Mixer and add the almond meal/powdered sugar mixture, all at once. Fold until the batter drops from your spatula in one continuous ribbon. Place the batter in a pastry bag fitted with a large round tip. 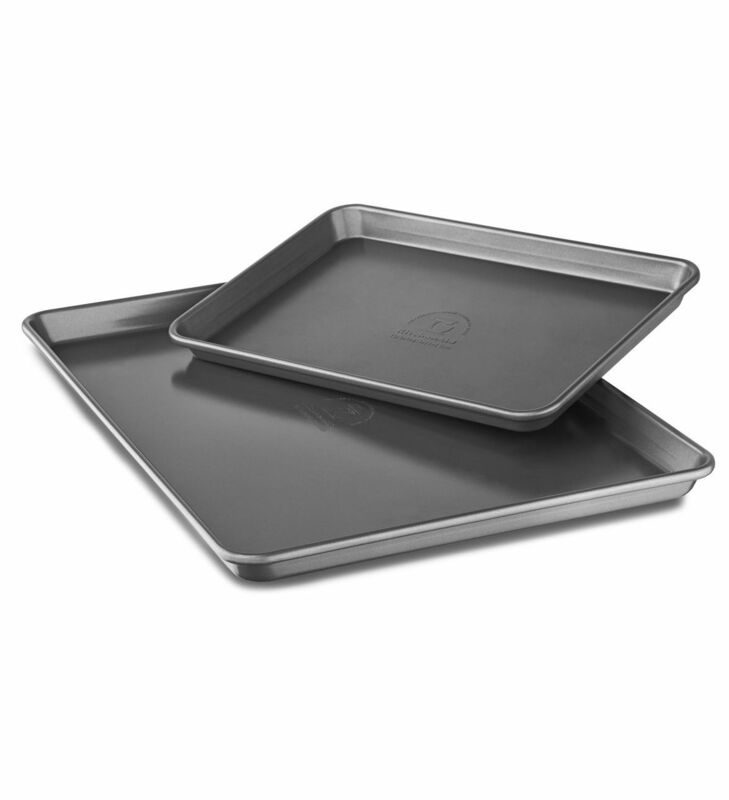 Pipe 1-inch diameter rounds on a parchment-lined KitchenAid® Nonstick Sheet Pans. Rap the KitchenAid® Nonstick Sheet Pans sharply on the counter to force out any large air bubbles. Preheat the oven to 375 degrees F, and allow the macarons to dry for 20-30 minutes, or until a thin, dry membrane has formed on the surface. Place in the oven to bake, and immediately drop the temperature down to 325 degrees F. Bake for 14 minutes. Cool completely. 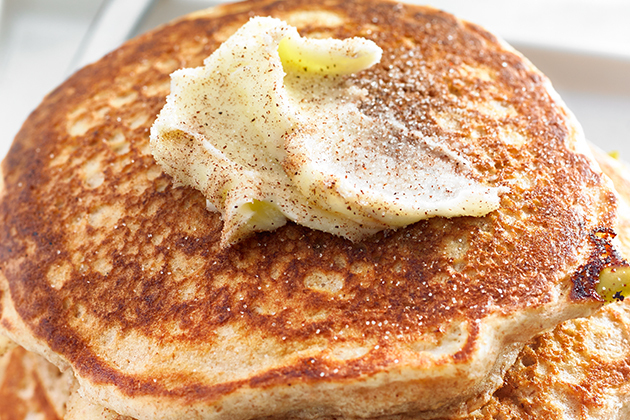 Place the egg white and sugar in the smaller bowl of the KitchenAid® Stand Mixer, and whisk to combine. Remove the bowl from the heat and whip on high speed, with the whisk attachment, until no hint of warmth is left when you feel the side of the bowl. When the mixture is thick and fluffy, add in the fresh strawberries and rosewater. Whip on high speed until the frosting is fluffy and smooth. Pipe the strawberry rose buttercream in a ring around the outside (bottom) edge of one macaron shell. Fill the well in the middle with about 1/8 teaspoon of strawberry jam or preserves. Top with another macaron shell. *Macarons are best served the day after assembling. Love the tutorial! I can’t get enough of macarons and can’t wait to try this flavor! What a fantastic tutorial! I might actually be able to do this 🙂 Thanks so much for the recipe, Ally! This is a great step-by-step tutorial. 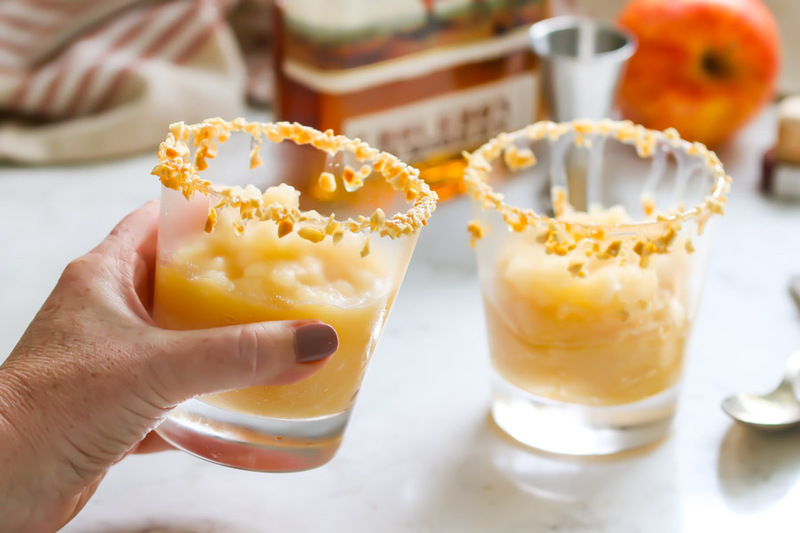 I can’t wait to try these — they look perfect for Mother’s Day! These macarons look gorgeous – love the tutorial! I have tried doing these and finally the 3rd time using your tutorial I got amazing macarons!! thank you for all this detail, helped a lot! still need to practice more, but I think they are looking quite good :).